When looking for the best flat irons for thick hair, it’s important to find one that will get the job done without damaging your beautiful hair. We totally understand! To help you out, we found 10 of the best flat irons that are perfect for taming your thick hair into a sleek, shiny style! Before you invest in a new flat iron, here are a few features to get familiar with when choosing your new iron. Okay, let’s get started! Plate Size: The iron plate width determines how much hair passes through each time. Wider plates can handle more hair in one pass, which is great if you have a lot of hair. Narrow plates are good for detail work and travel. 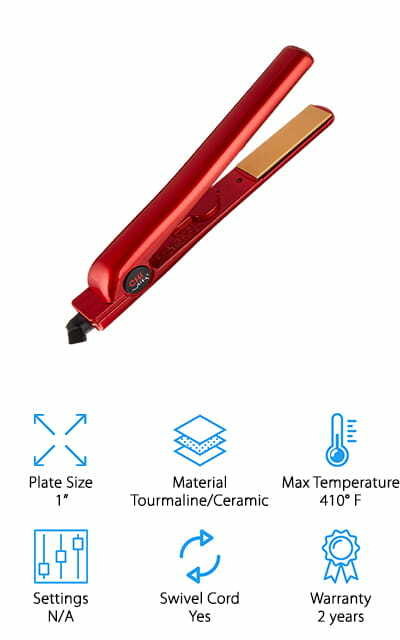 Material: Many high-heat flat irons are made with ceramic plates that are made to heat up quickly and are less likely to leave hair frizzy, dry, or damaged. For added protection, some plates are coated with materials like tourmaline and titanium. 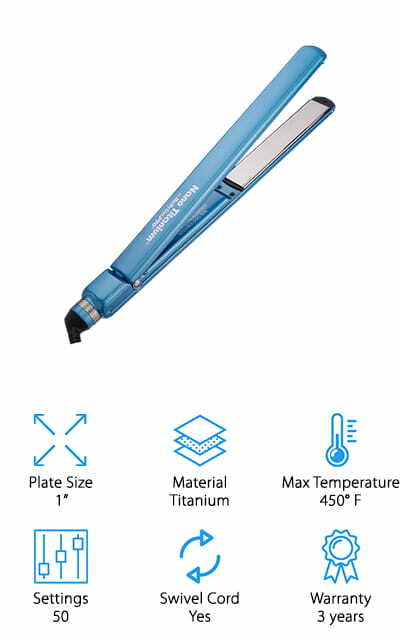 Max Temperature: A good flat iron for thick hair must be able to get pretty hot, so pay attention to the max heat temperature. The higher the temperature, the better your iron will be able to flatten thick hair with fewer passes. Temperature Settings: In addition to the max temperature, it’s good to know how many heat settings your iron can handle. Some flat irons have a few heat settings to choose from, while others let you set the temperature down to the degree. Swivel Cord: A swivel cord allows you to spin the iron without twisting the cord. It can help extend the life of your iron. This can also be a nice feature if you plan to use your iron for waves or curling. Warranty: Any time you invest in electronics, it’s important to make sure it has a warranty in case something breaks or malfunctions. It’s a good sign that the company stands by their product and will fix or replace it if needed. It’s time to get into the reviews! Here are 10 of our favorite irons that are made to handle thick hair. Whether you want the best professional flat iron for thick hair, or a travel-sized iron to take on your next trip, we have several options to pick from! Short on time? No problem! We started off with our Top Pick and Budget Pick first, so start there and return when you have more time to read about the rest. CHI is a popular brand among stylists and home users for high-quality hair tools. We think that the G2 is the best CHI flat iron for thick hair because it really gets the job done! The ceramic and titanium plates heat up quickly and stay hot while you work over your entire head. We also like the 1.25-inch wide plates, which are great for straightening long hair quickly because they grab more hair per pass. 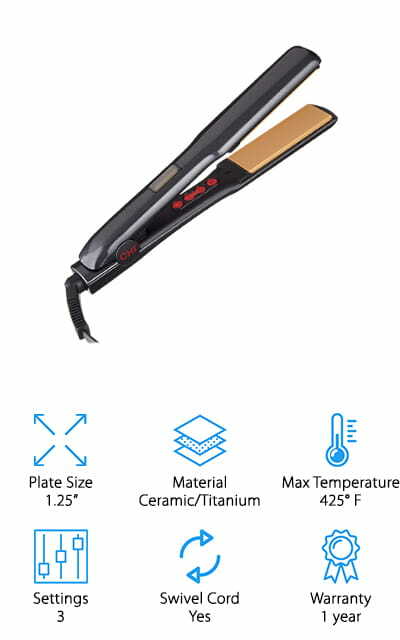 The iron has 3 heat settings: a lower setting for fine hair, medium setting for wavy hair, and a high setting that heats up to 425 degrees for thick and coarse hair. Just set it and wait for the LED lights to glow, indicating that it’s ready to use! We also like that this iron has a swivel cord to prevent cord tangles. You also get a thermal mat to use under your iron to keep your bathroom countertop or flooring safe from the heat! 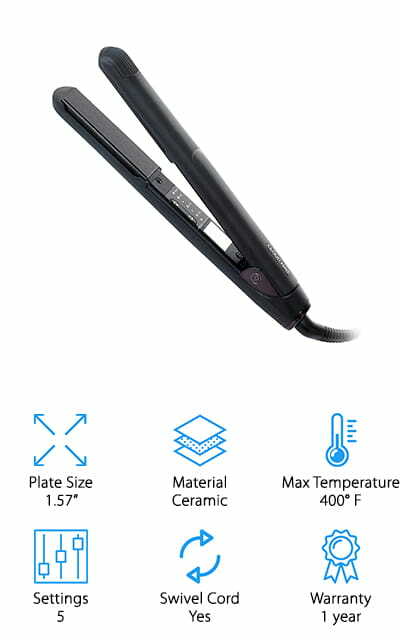 If you’re looking for the best flat iron for thick hair that won’t break the bank, consider grabbing this high-performance 2-in-1 straightening and curling iron from Furiden! 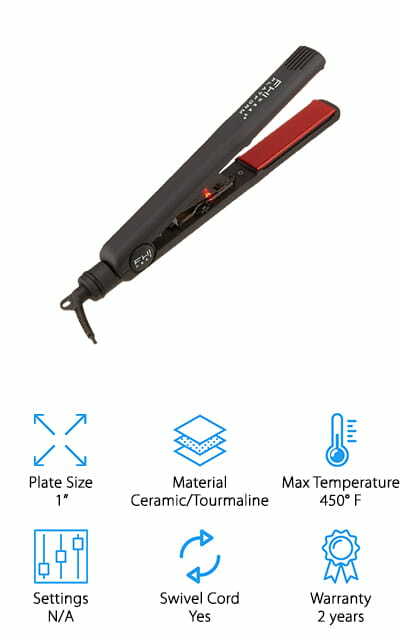 This inexpensive flat iron uses professional-grade tourmaline and ceramic plates to give your hair the smooth texture you want without frizz or breakage. The 1-inch plates are great for both long and short hair, and the curved barrel design makes it easy to use this to curl your hair as well! It has 5 heat settings, with the highest setting going up to a blazing 450 degrees to tame even the most unruly hair. We also like that it only takes 15 seconds to fully heat up, so you can save time each morning by not having to wait for it to heat up! The swivel cord is an extra-long 97 inches, so you can easily use this across the room from a wall plug, or walk around if you feel like it! For a salon-level hair straightener, we think this iron from BaByliss is a great flat iron for thick hair that will last a long time. The 1-inch titanium plates are corrosion-resistant and high quality and they’re 5-inches long to help you straighten more hair with each pass. This flat iron is great for short and medium lengths since you can get into tight spaces and grab short hair well with the narrow plates. You can also get it in a 1.5-inch or 2-inch size for longer hair, too! We like that this iron can be set to the temperature desired, with 50 temperature settings to give you a truly salon-quality, custom experience. It also heats up quickly, so you can get your hair done and get on with your day! We think this is the best hair flat iron for thick hair to invest in if you have short hair, or if you want a thinner iron for better control! Next up is this budget-friendly hair straightener from LumaBella that has everything you need for a frizz-free style in minutes! The ceramic plates on this iron are infused with Keratin conditioners, which help keep hair moisturized and frizz-free while you straighten or curl your hair. We also like that this is has a smooth, round design that’s perfect for both straightening and curling your hair! 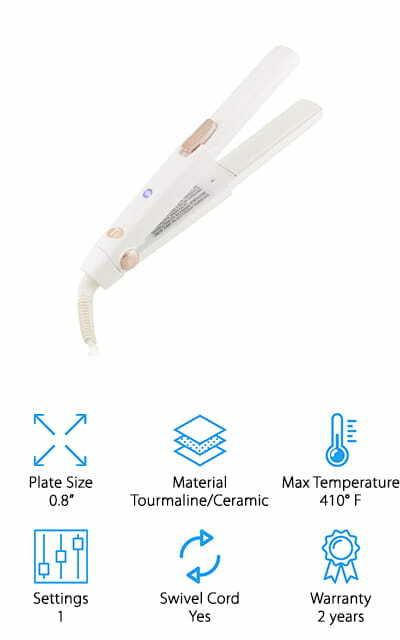 It has 5 heat settings that go up to 450 degrees, so you can straighten coarse or thick hair easily. You can tell when the iron is ready by the light-up display on the handle. This is a cool feature that looks nice and prevents you from hitting buttons on accident while using the iron. We also like that it comes with a heat sensor that reduces the heat if it gets too hot. There is also an auto shut-off if it overheats or is on too long – a major plus to prevent potential fires! On our hunt for the best rated flat iron for thick hair, we ran across this familiar brand, FHI, which we’ve seen in plenty of salons – and for good reason! 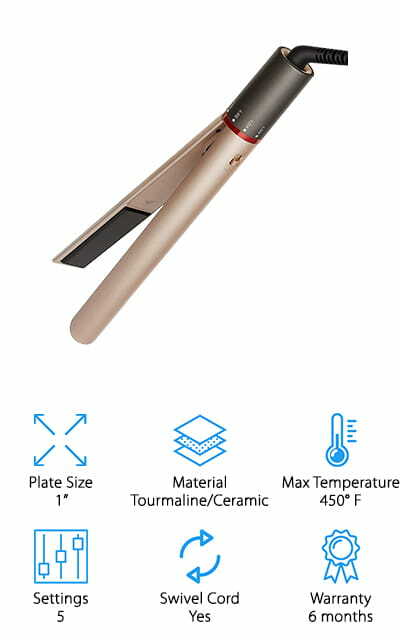 This ceramic and tourmaline hair iron heats up to 450 degrees and allows you to choose the exact temperature you want instead of relying on pre-programmed settings. The plates heat up quickly and stay hot, even after you’ve been working on your hair for a while. You can straighten even the thickest and most coarse hair with this, or use it to create waves and curls for some added texture and bounce. We also like that the plates are beveled on the edges, which makes curling easier and also prevents those dreaded crimps you can sometimes get from flat irons! It also comes with a carrying case and thermal mat, so you can take this with you on your next trip to keep your hair looking beautiful wherever you are! 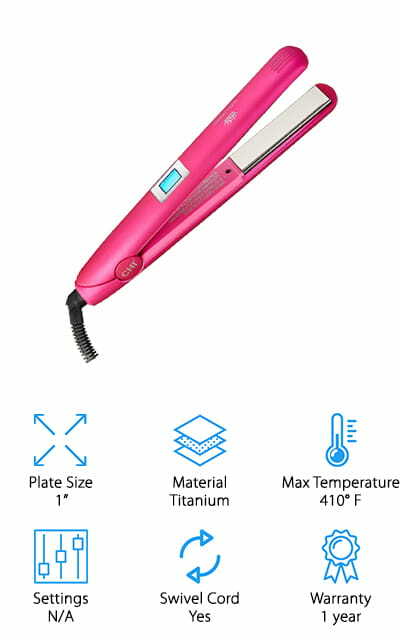 If you need a hair straightening iron that you can take with you all around the world, consider picking up one of these amazing irons from Cloud Nine. This iron uses universal voltage, so you can use it anywhere in the world with the proper adapters! It’s not only convenient for international travel – it’s also a great iron for thick and curly hair! The 1.57-inch plates are made of ceramic, which heats up in less than 20 seconds and stays evenly heated to give you straight hair quickly. There are 5 temperature settings that go up to 400 degrees (or about 200 degrees Celsius) to handle both fine and thick hair well. This straightening iron also comes with a heat-resistant carrying case and cover to safely pack it in your luggage and go. We think this is a great iron for people with thick and unruly hair who want to be able to take it with them wherever they go! If you have a lot of hair to straighten fast, we think this is the best ceramic flat iron for thick hair that can tackle a lot of it quickly! This iron heats up to 450 degrees, which is hot enough to handle super curly, thick, or coarse hair. It takes only 60 seconds to fully heat up, so you can get to styling without waiting. Instead of predetermined settings, it uses a dial that allows you to set the exact temperature. This gives you more precise control over how hot you want the iron to be to get the best results. The tourmaline-coated ceramic plates heat up evenly and help to prevent static and fly-aways, so you get a smooth and shiny look each time. You can even use this to create waves and curls, too! The 9-foot long cord with a 360-degree swivel is great for use in a salon or at home and prevents damage from twisting. Another great CHI flat iron for thick hair is their classic Fire iron, which works incredibly well on both fine and coarse hair textures alike! The 1-inch plates are perfect for straightening short and medium length hair. You can also use the iron to create curls and waves if you want to mix things up sometimes! The plates are ceramic coated in tourmaline, which heats up evenly and prevents frizz and static from forming, especially as you run it over dry hair. You can set the temperature to exactly what you like, ranging from 180 degrees for thin, fine hair to 410 degrees for thick, coarse hair. We also like that it comes with a heating pad you can place under the iron to protect your countertop, or use it while sitting on the floor without damaging your rug or carpet! If you want a tried and true classic hair iron that will do the job, pick a CHI Fire! 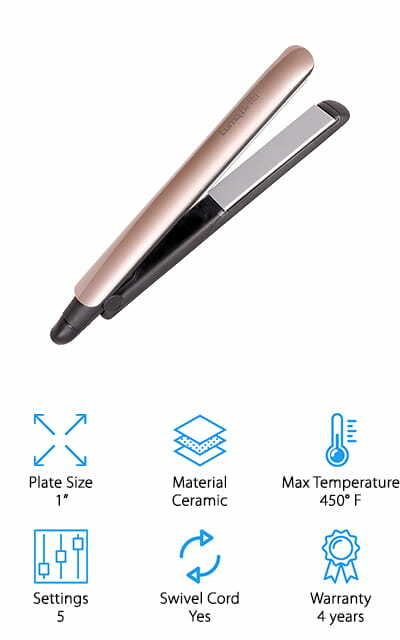 If you want a travel-sized flat iron to tame your thick hair, this compact “single pass” straightener from T3 is perfect for taking on your next vacation! The 0.8-inch plate size is great for short hair and keeps this hair iron small enough to easily stow away in your weekend bag or suitcase without wasting precious space. It works well to straighten or mix things up by creating curls of waves in one pass. The tourmaline-coated ceramic plates heat up fast, stay evenly hot, and work hard while protecting your hair from frizz. It only has one heat setting – 410 degrees – so you don’t have to worry about fussing with dials or settings when you’re on the go. If you have thick or coarse hair, which should be plenty hot enough to get the job done. It comes with a heat-resistant cap, so you don’t have to wait for it to fully cool before adding it back into your luggage. Looking for gorgeous, pageant-quality hair for your next formal event, or just to rock every day? Grab one of the Miss Universe flat irons from CHI! The 1-inch titanium plates are great for straightening thick and unruly hair, leaving it sleek and shiny. It has a heat range of 160-410 degrees Fahrenheit, so you get to choose the exact heat level that’s right for your hair and chosen style. The digital display lets you set the temperature and know when it’s heated up and ready to use. We also like that this flat iron uses dual voltage, so you can use it anywhere in the world with the proper adapters – a must for international travelers! The pretty pink color will look great on your countertop, too! We think this would make a great gift for the beauty-obsessed in your life, or for a young man or woman who is learning how to use a flat iron for the first time!